There are so many reasons to bake your own apple chips. For starters, they’re a tasty yet healthy snack. Secondly, they’re a great way to preserve apples for when the fresh Ambrosia run out. Thirdly, kids love them and they won’t argue about eating them. And finally, while baking Ambrosia apple chips your house will smell like you live in an apple pie. And the best part is, these are super easy to make (as long as you have a bit of patience). Grab 2 large (or 3 medium) Ambrosia apples. 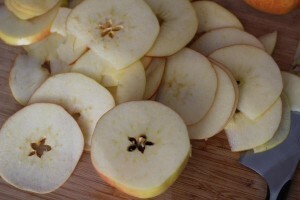 Thinly slice them width-wise so you have apple discs. Use a Mandolin if you have one otherwise, a sharp knife will do the trick. The thinner you slice them the crispier they’ll be. If the apples are really big, consider slicing them down the middle and working with half moon shaped slices instead of circles. You can use an apple corer if you have one, but as long as you remove the seeds somehow, you don’t really need to worry. 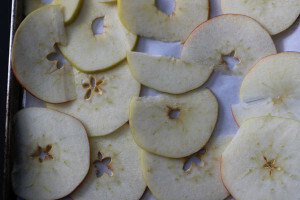 Place the Ambrosia apple slices on parchment paper lined baking sheets. Keep it to a single layer or the apples will stick together and they won’t dry out. 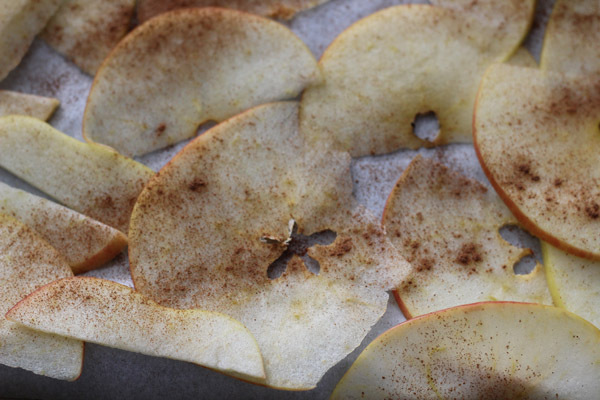 Sprinkle apples slices with cinnamon (to taste). Warning: some recipes call for cinnamon sugar but Ambrosia apples are already quite sweet so we don’t think you need the extra sugar. It’s up to you. Hot tip: If you like things a bit spicier, try sprinkling the apples with a combination of cinnamon, cayenne and ginger. Place trays in a pre-heated, 200° oven. After 90 minutes, flip the slices and let them go for another 90 minutes or so. This is going to require a bit of your own judgement because the timing really depends on the thickness of the apple slices. You’ll want to pull them out when they look a bit brown and are starting to crisp up. Allow them to cool and then place them in a bowl. 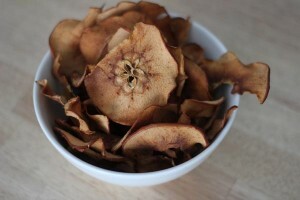 These Ambrosia apple chips make great snacks on their own but you can also get creative with them. For example, Chef Michael Lyon uses them (without the cinnamon) in this recipe for Apple Crusted Pork Loin. Or, you can treat them like a cracker and serve them as appetizers with a dollop of herb and garlic goat cheese. They’re also great for dipping in hummus, peanut sauce or, if you’re feeling decadent, chocolate or caramel sauce.